Columbia Police Department (CPD) investigators are releasing a surveillance picture of an armed robbery suspect who’s accused of stealing money from a discount store last night. The man also matches the description of a suspect in connection with two similar crimes. The suspect is described as a heavy-set black male wearing dark pants and a gray hoodie with dark gloves and a ski mask in an attempt to partially hide his identity. One victim describes the man as having a large mouth and in particular lips of a dark tone. Investigators ask that you pay close attention to the gray athletic shoes in the surveillance picture and the robber’s stance. 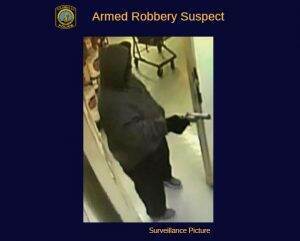 In the last incident, the suspect discharged his weapon in the air inside the store; no one was injured as a result.